An estimate 1.200 people could live in Machu Picchu. In fact it is difficult to speak about a city because there are not even 200 buildings. There is a religious, a military and a residential area divided by a majestic square. Nevertheless it takes some time to visit all buildings separately. In the religious area you'll find the temples, the royal sarcophagi, the Intihuatana and the residential buildings of the priests. A fair part of the religious area is reserved for the Inca, his consort the Mama Occla and the royal household. A temple-like building with three big windows made of life-sized granite blocks perfectly fitting together, did Bingham suspect he found Tamo-toco. The description of the (never found?) legendary temple with the three windows were the symbol of the caves where the divine Father of the first Inca (Manco Capac) lives, looks alike the odd building in Machu Picchu. 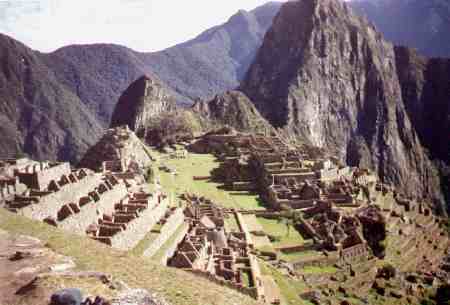 But this is uncertain because the style of the Sacred City is late-Inca. The highest part of the religious area is the Intihuatana. 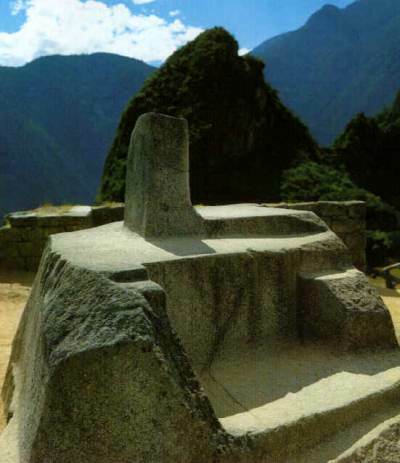 Next to this most sacred place is a flat little square from where a high priest or the Inca could talk to his people. The acoustic is perfect on the big square below, similar to the modern auditoriums. On the right hand side of the main square is the residential area and on top, on a rocky hill, the military zone. The Intihuatana itself is a kind of sundial perfectly shaped out of the highest peak of a natural rock (see on the picture on the right hand side, the mountain on the background is the Huayna Picchu). "Inti" means "Sun" and "Huatana" "catch", a rock that holds to Sun so to speak. It was an altar to worship their highest visible god, the Inti. The people in the Peruvian highlands still come together on solstice to offer prayers and flowers on the Intihuatana in and around Cusco. 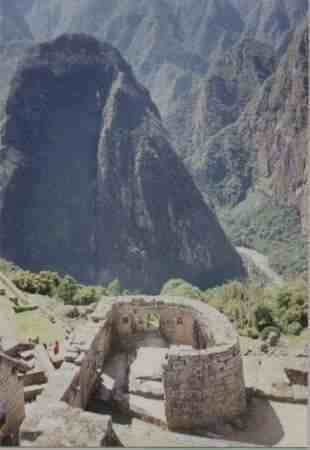 In fact, Machu Picchu was never desolated. Is it the city where the Spanish were looking for during ages, El Dorado? When the professor Hiram Bingham arrived he encountered some farmer families living there. They told him this was the perfect place for not paying any taxes or doing military service. Bingham also found some graffiti on some rocks scratched by former visitors who left their names. One of them was Antonio Raimondi, the Count of Sartiges and Charles Wiener. The names of the Santander brothers can still be seen at the lower parts of the Temple of the Sun (1909). The great Inca Pachacuti probably ordered the building of the city as a religious retreat place because the style of the houses and temples are from his government. Lots of buildings can be named remarkable. The Torre�n for example, also known as the temple of the Sun (see picture left, in the sacred valley streams the Vilcanota) is constructed above a cave, a cavern that served as storeroom for the mummified Incas and other dignitaries and as a ritual offer altar. The Torre�n itself is built with firm granite, perfectly smoothed and fitting into each other. In the temple is a little Intihuatana chopped and served as a solar observation place, this is also visible on the picture on the right hand side. Most probably there was no roof to protect the temple against rain and wind. The windows point to the places where the Sun rises on respectively the summer- and the winter solstice. These days (the 21st of December and the 24th of June) stream the first sun rays into one of this windows through the Inti Punctu (the Gate of the Sun) or the valley on the other side of the Vilcanota. More remarkable things are discovered in Machu Picchu.